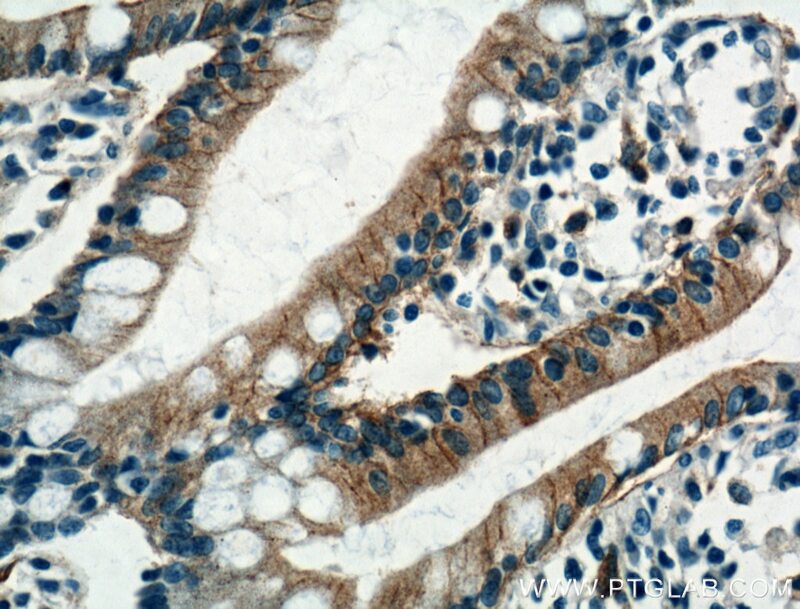 Immunohistochemical analysis of paraffin-embedded human small intestine tissue slide using 20436-1-AP( GLUT2 antibody at dilution of 1:500 (under 40x lens). 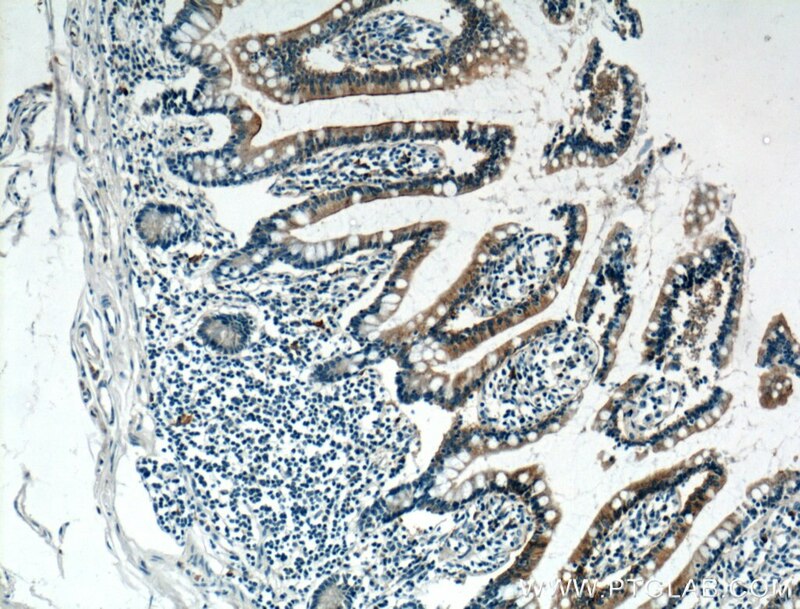 Immunohistochemical analysis of paraffin-embedded human small intestine tissue slide using 20436-1-AP( GLUT2 antibody at dilution of 1:500 (under 10x lens). 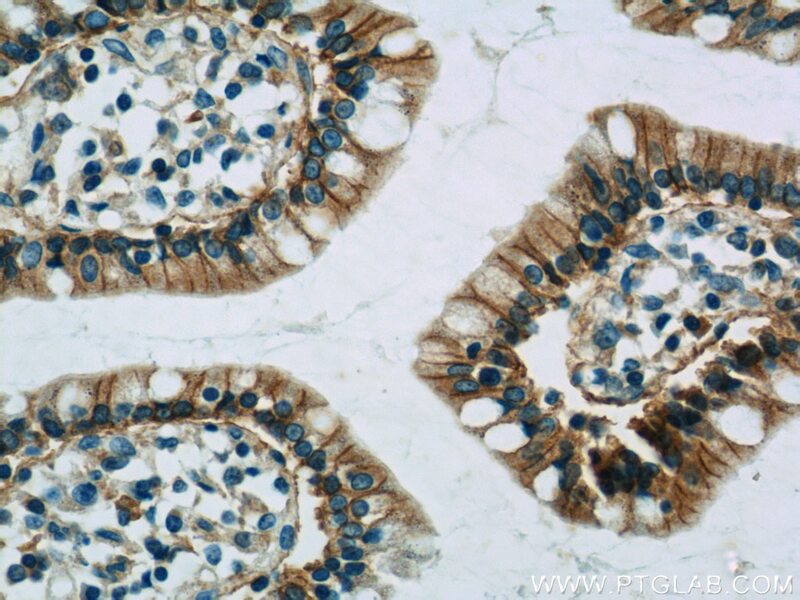 IP Result of anti-GLUT2 (IP:20436-1-AP, 4ug; Detection:20436-1-AP 1:1000) with mouse kidney tissue lysate 4000ug. Glucose transporter 2 (GLUT2), also known as solute carrier family 2, facilitated glucose transporter member 2 (SLC2A2), is a transporter protein regulating glucose transport across cell membranes in an insulin-independent manner. What is the molecular weight of GLUT2? 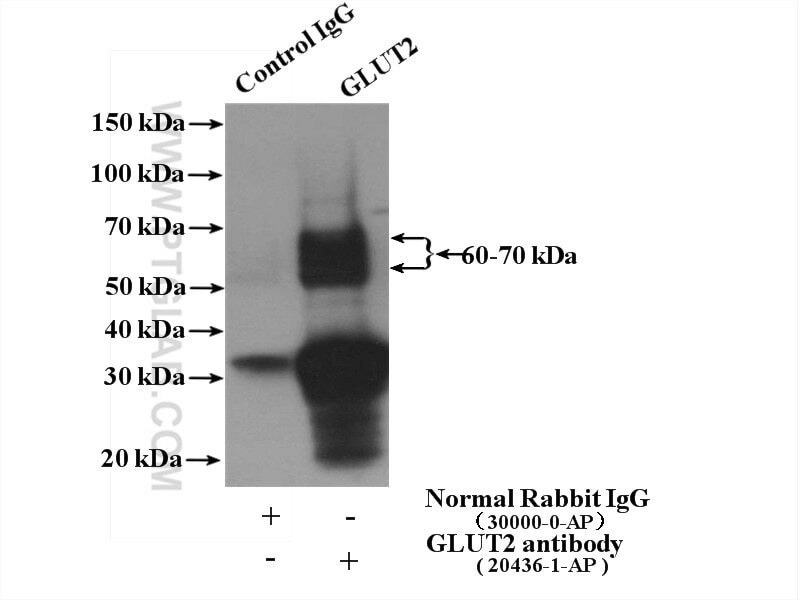 Is GLUT2 post-translationally modified? 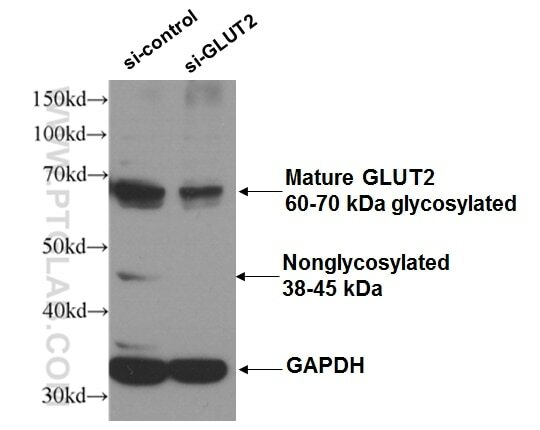 GLUT2 can be N-glycosylated. The molecular weight of mature glycosylated GLUT2 transporter is between 55 and 65 kDa, but a minor 38-kDa form is often detected in hepatocytes that may represent a non-glycosylated or proteolytic product (PMID: 12101013). What is the subcellular localization of GLUT2? Glucose transporters, including GLUT2, are multiple-pass integral membrane proteins. GLUT2 is present at the plasma membrane but has also been reported to be present at intracellular membranes, including the endoplasmic reticulum (PMID: 12101013). What molecules can be transported by GLUT2? Although the main substrate of GLUT2 transport is glucose, it can also transport galactose, mannose, and fructose. 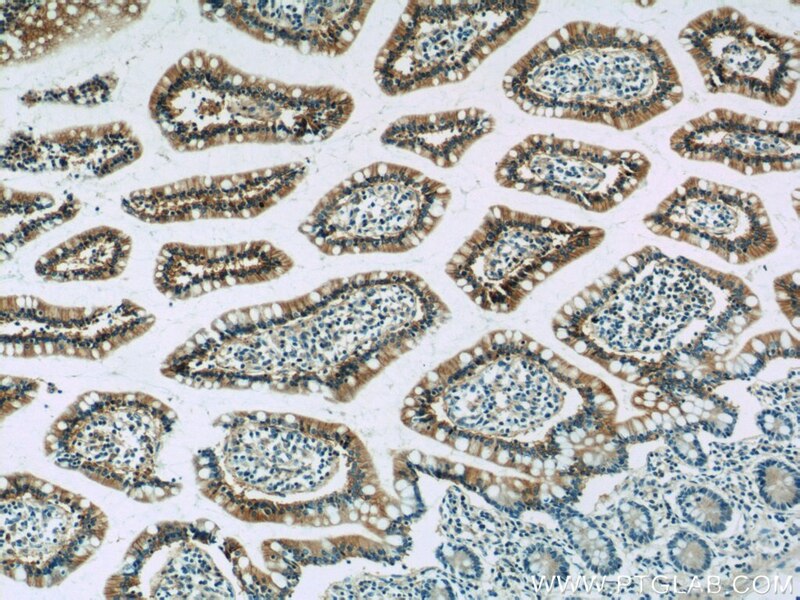 What is the tissue expression pattern of GLUT2? GLUT2 is expressed in many cell types. High expression of GLUT2 is observed in hepatocytes, where GLUT2 mediates glucose uptake and release regulating glucose levels in blood, in intestinal cells, where it regulates glucose transport at the basolateral membrane and to a lesser extent from the apical membrane, and in the kidney proximal tubule, where it is involved in glucose reabsorption and is present at the basolateral membrane. Human Mesenchymal Stem Cell Derived Exosomes Alleviate Type 2 Diabetes Mellitus by Reversing Peripheral Insulin Resistance and Relieving β-Cell Destruction. T1R2 receptor-mediated glucose sensing in the upper intestine potentiates glucose absorption through activation of local regulatory pathways.